The mid-90s was all about album covers when it came to metal exploration. Magazines, mail order catalogues and pieces of early metal websites and fanzines were heavy on imagery. I can recall getting a ton of new bands at the time just on artwork alone. Vivid, colorful expressions adorned the likes of Tad Morose, Morgana Lefay, Moonspell, Cradle of Filth, In Flames, and Edge of Sanity to name a few front runners. My buddy DJ Church and I were heavy into collecting at the time and, like most mopheads, were mired in the Swedish death metal sound. Already, artwork for In Flames had secured 'The Jester Race' way up top on our "these bands will be huge" list. Along with the booming influx of Gothenburg bands came a whole host of acts that plugged into 80s traditional metal but injected thrash and death overtones to create what is often referred to as the Gothenburg sound (which later influenced the New England states' sub-genre New Wave of American Heavy Metal). However, in 1997 a band was on the cusp of creating a whole new level of excitement in Sweden and the whole European scene. Essentially, the traditional metal landscape created by the likes of Iron Maiden, Saxon, and Judas Priest was on a bit of a downward spiral in the 90s. Those big bands were now on smaller labels, performing at smaller clubs and the true as steel traditional sounds were few and far between. Sure, bands like Helloween and Blind Guardian were active and vitalized, but as whole newer bands were focusing on the In Flames, Arch Enemy, and At the Gates sounds. So, it was with great anticipation to await a new Swedish talent that promised to turn back the clock and capture the 80s magic again. 'Glory to the Brave' was released in June of 1997, 20-years ago, for powerhouse label Nuclear Blast. It was the debut of this brand new young band and HammerFall had the metal community talking. The Gothenburg act originally formed in 1993 when Ceremonial Oath guitarist Oscar Dronjak paired with In Flames' guitarist Jesper Stromblad for a new project. The two invited Niklas Sundin, Johan Larsson and Dark Tranquillity singer Mikael Stanne to come on board. Later, Sundin and Larsson were to be replaced by In Flames guitarist Glenn Ljungstrom and Fredrik Larsson (Crystal Age). After perfecting a series of classic 80s metal covers, the group entered the Rockslaget competition in 1996. Stanne couldn't perform that night so the band acquired Joacim Cans to sing for them. History had been made. Later Stromblad and Ljungstrom left the project along with Larsson. The replacements were Stefan Elmgren, Magnus Rosen and studio drummer Patrik Rafling. Nuclear Blast quickly signed the band and 'Glory to the Brave' was released globally. The band's colorful artwork was created by German artist Andreas Marschall (Grave Digger, Running Wild), the same talented illustrator that had lured me in with In Flames' 'The Jester Race' the year before. 'Glory to the Brave' was a wonderful throwback to the 80s traditional sound. Often mislabeled as "power metal", HammerFall simply embellish all of the same tendencies utilized by heavyweights of metal. Operatic vocals, twin guitar harmonies, galloping rhythms, medieval lyrical imagery and rapid drumming. It's the perfect formula made all the more better by Swedish 90s powerhouse producer Fredrik Nordstrom (In Flames, Arch Enemy). His modern production magnifies all of the tools of the trade, working magic with these traditional metal elements. Out of the gate comes the cannonfire drums and charging rhythm of "The Dragon Lies Bleeding". Cans' opening lines "We Ride" is an operatic statement. Lyrically, the first verse starts with "Ride through the valley in thunder and rain, the battle is raging, redeem this domain". It's a powerful anthem, showcased with blazing fretwork and fast double-bass. The entire record flows with that same youthful energy, both borrowing from the 80s but re-imagining it for modern appeal. Cuts like "The Metal Age", "Steel Meets Steel" and "Stone Cold" are stories told through a chainmail of Teutonic riffs and sing-along lyrical presentations. 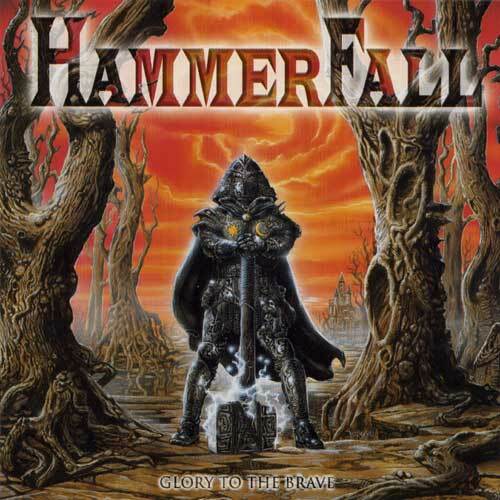 "HammerFall", the obligatory moniker song, matches the album's intense valiant artwork. "All for one! Our burning hearts will live forever, one for all, together standing strong" is a rallying call for the denim and leathers to unite. The group pay their respect to "Ye Olde Metal" with a stunning cover of Warlord's "Child of the Damned", a fan favorite and longtime staple of the band. One would assume this 45-minute classic did very well for Nuclear Blast. The band would stay on the same label for a remarkable 17 years and eight more studio albums. After early runs as touring support, the band quickly became headliners the world over. Legions of fans flocked to the band's traditional sound and became Templars of the HammerFall. 20-years later, the band is probably playing songs from this album in a town near you tonight. ` Metal circles point to 'Glory to the Brave' as kickstarting a power metal sensation in the 90s. A huge upswing in traditional and power minded bands emerged after HammerFall broke in. ` I saw the band in November of 1998 open for Death. While some in attendance weren't familiar with the band, they secured two encores as openers. The first was a studio cut and the second featured all of the band members switching instruments and playing "Breaking the Law". ` While Jesper Stromblad was a guitarist for In Flames, he was recruited by Dronjak to perform drums for HammerFall. ` Dream Evil vocalist Niklas Isfeldt provides backing harmony on the album. Isfeldt collaborates with 'Glory to the Brave' producer Fredrik Nordstrom in Dream Evil. ` Fredrik Nordstrom, along with producing, also contributed keyboards and backing vocals. ` he album was mastered by Goran Finnberg, a well-known name associated with other notable Swedish superstars like Arch Enemy, Dark Tranquillity, In Flames, and Opeth. ` Often you would find yours truly adorning a long sleeve HammerFall shirt with the proud words "A Heavy Metal Heart Is Hard to Tear Apart" across the back. I wonder where that old tattered thing is now?